In the saga of Tudor historic chronographs, the reference 7169 happens to be an icon. Since its launch in 1973 it has been produced in a number of different versions, one of the most fascinating features distinctive touches of blue, grey and orange. It was produced for only a few years. We’re going to look at its new interpretation, the Heritage Chrono Blue, as well as at its black brother. Both watches share exactly the same characteristics just differing in their appearance. Tudor’s approach to the design of these two chronographs was exactly the same as for all the watches in the Heritage line since 2010. Far from being merely a new version, these two watches are a reinterpretation in which past, present and future converge in both time and style. While all the aesthetic codes that contributed to the recognition of the historic models remain – a synthesis of the original spirit of the timepieces and a faithful reproduction of their key characteristics – Tudor’s Style Workshop has added modern touches to update the iconic spirit of these watches and endow them with a timeless strength. The Tudor Heritage Chrono and Heritage Chrono Blue mirror the original shape and proportions of the middle cases, bezels, lugs and bracelets of the 1970s models. Only a closer look reveals a series of new design details. The bevelled and polished edges of the lugs, the stylized shoulders to protect the crown, and the knurled edge of the bidirectional rotatable bezel (featuring a black or blue aluminium insert and providing a second time zone) and of the pushers that flank a knurled crown to improve grip. With measuring 42 mm in diameter, the stainless steel-cases are keeping up with the dimensions of today’s chronographs. They also boast a water-resistance of 150 metres. 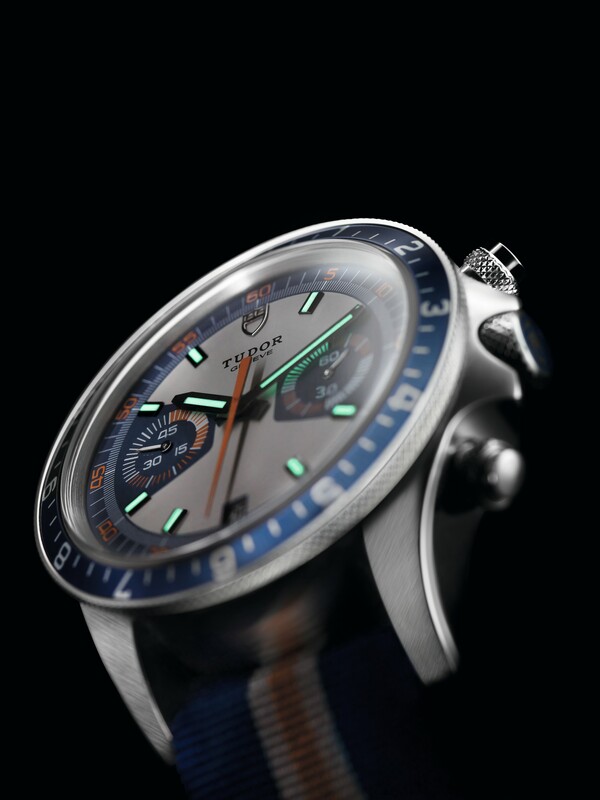 The dials are enhanced with orange details and feature 3D applique hour markers with bevelled edges and Super-LumiNova to enhance legibility. They also feature two counters located inside two trapezoidal shapes, one at 3 o’clock for the small second’s hand, and one at 9 o’clock for the 45-minute counters, reiterating the one of the 1970s. At 6 o’clock, Tudor placed a small date window. 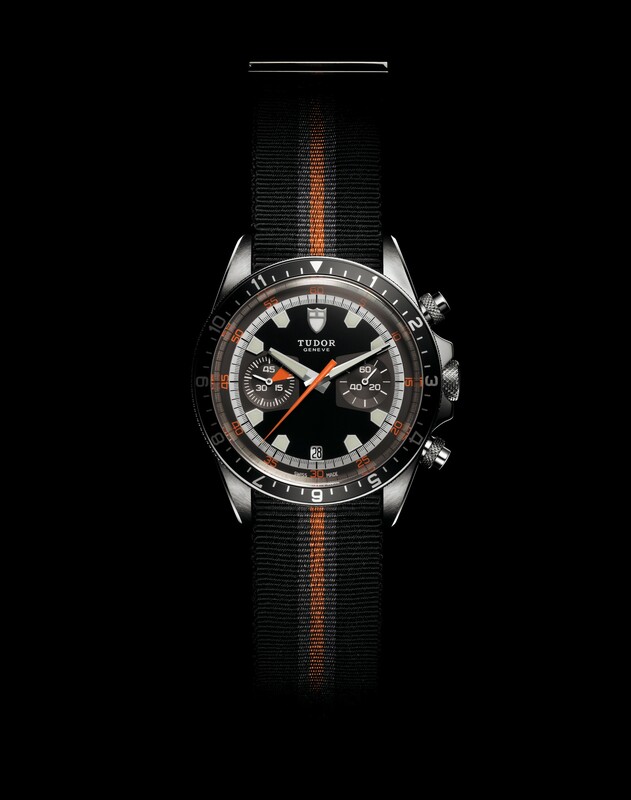 The Tudor Heritage Chrono watches are powered by the calibre 2892. The self-winding mechanical movement provides a power-reserve of 42 hours. 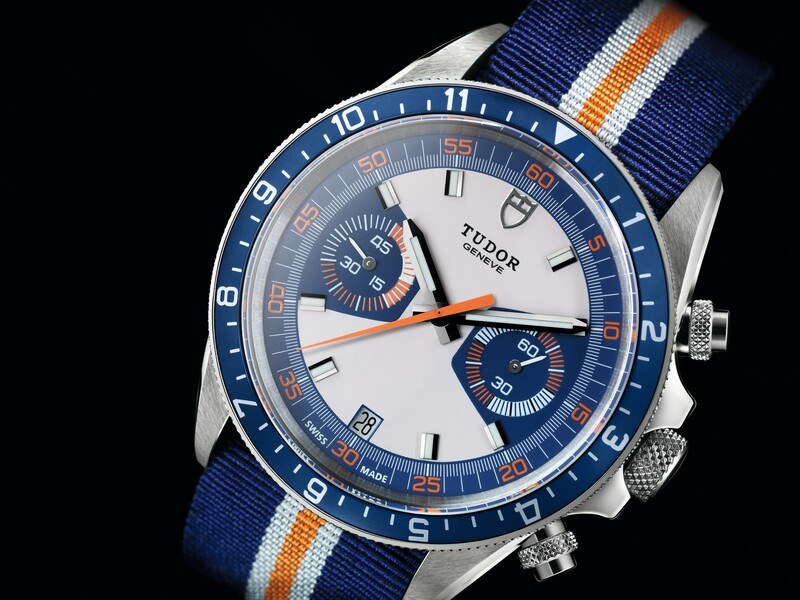 The Tudor Heritage Chrono and Heritage Chrono Blue come with both a three-link steel bracelet as well as a black, grey and orange or blue, white orange fabric strap. The Tudor Heritage Black Bay derives its overall lines and its domed crystal from the brand’s first divers’ watch, the Submariner launched in 1954. It also ownes its ancestors domed dial. It’s winding crown is a nod to the model presented in 1958. The characteristic angular Hands of the Heritage Black Bay which are known as “snowflakes”, were seen from 1969 to the early 1980s. And now there’s a new version. The Heritage Black Bay was originally released in red, then in blue and now it is available in black. 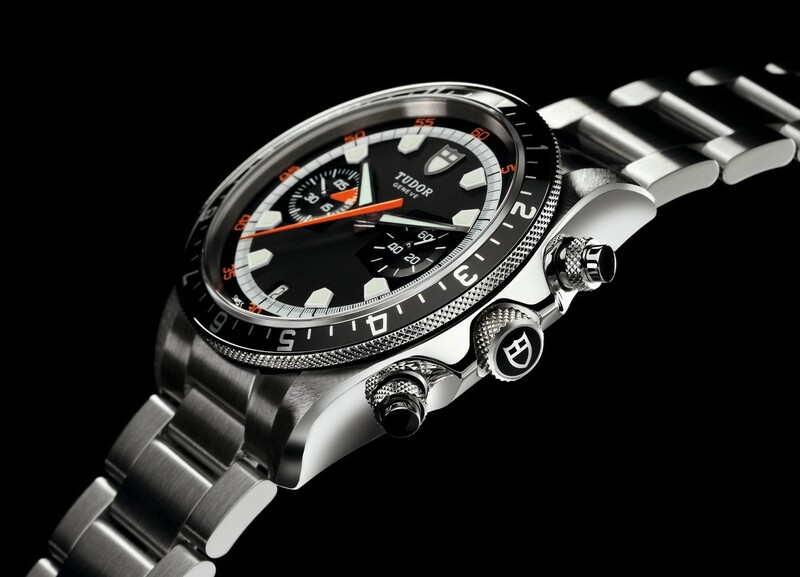 This dive watch was released for the fist time in 2012, in 2013 it won the Grand Prix d-Horlogerie de Genève in 2013. This model excites because with its design it’s back to the roots. The dream of every vintage watch lover. This tool can be used every day, it not only can be but should be taken to the pool, on the beach and diving. 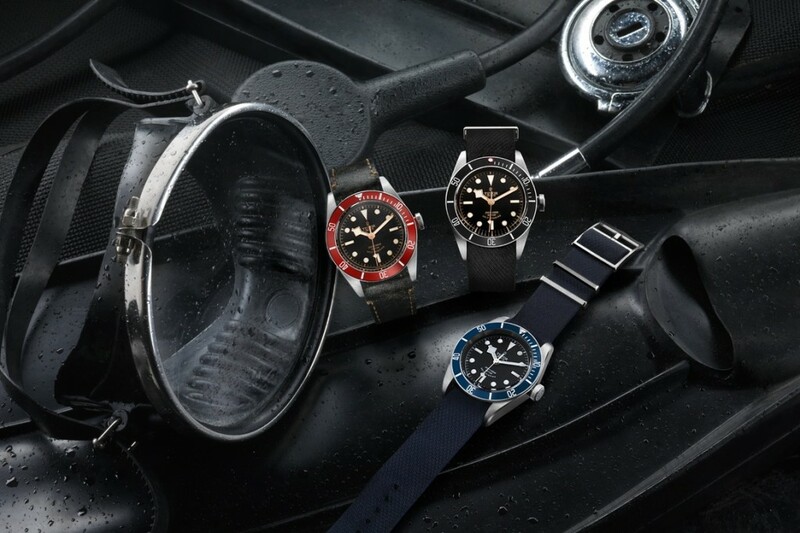 This is what the Tudor Heritage Black Bay is made for. The dial is black and protected by a domed sapphire crystal. The watch features hours, minutes and seconds but no date. The steel case is 41 mm in diameter with a polished and satin finish. The steel bezel is unidirectional rotatable and matt black, matt blue or matt burgundy red with silver printing. The screw-down crown, also known as “Big Crown” is engraved with the tudor rose and it’s colour matches the one of the bezel. The Tudor Heritage Black Bay is powered by a self-winding mechanical movement, the Tudor calibre 2824. This calibre provides a power reserve of approximately 38 hours. 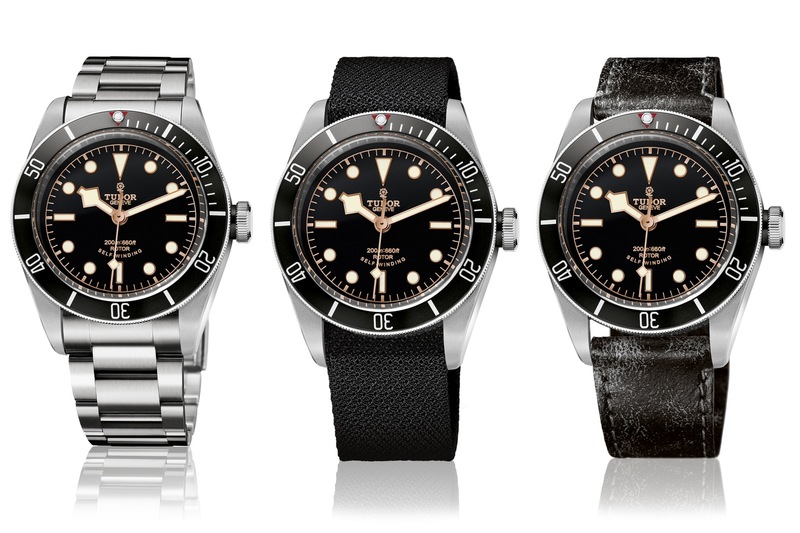 The Tudor Heritage Black Bay comes with a steel bracelet or an aged leather strap. Additionally there is a fabric strap available. And every watch from this collection is waterproof up to 200 metres. It’s a diver’s watch after all.